The 2016 Hyundai Tucson Sport is in one of the largest in most popular segments in America, but where many small SUVs fall short, the Tucson Sport shines much brighter than I could have expected – as it is fun to drive, roomy and it handles rough driving conditions very well. Before getting into all of the positives aspects of the 2016 Hyundai Tucson Sport, I want to take a second to acknowledge the shortcomings of many small sport utility vehicles. I like fast cars, fast trucks, fast SUVs and hard-working pickups – all of which appeal to me due to qualities which are relatively unheard of in the small SUV segment. These small SUVs, or crossovers as some prefer to call them, are often designed to minimize cost and maximize fuel economy. To do this, these vehicles are often very small, very low performance and very bare bones; especially in the case of “budget brands”. Hyundai is a “budget brand”, so it is widely expected that anything from their lineup is going to be affordable and fuel efficient, but at the expense of being dull to drive, cramped and fairly incapable as 4WD vehicles go. Predictably, the Tucson Sport AWD is affordable with a price as test of just $28,570 fully loaded and with EPA fuel economy figures of 24 city, 28 highway and 26 combined, it is very efficient for its size. However, what you don’t expect is that the Tucson Sport earns that “sport” designation, with driving characteristics that make it far more fun to drive than many competitors, but it also handles rough roads very well and most importantly – it offers a ton of space and amenities on the inside. The 2016 Hyundai Tucson Sport AWD only comes in one form, so everything discussed in the details below are standard equipment. There are no available packages on Hyundai.com and shy of a few accessories like a cargo net, mud flaps, wheel locks and a first aid kit, every Tucson Sport AWD is configured the same as the vehicle shown here. In this fully loaded form, my test vehicle had the aforementioned price of $28,570. On the outside, the 2016 Hyundai Tucson Sport AWD wears the familial styling that we see across the majority of the current lineup, with elongated projection headlight housings with LED trim flanking the large, angular grille. The Tucson styling is more upright than the company’s cars, of course, but the sculpting around the bottom of the front fascia works well in giving all of the Tucson models (not just the Sport) a very modern, aggressive look. Along the side, the Tucson Sport has unique 19 inch wheels positioned in wheel flares with contrasting black trim that combines with the body colored door handles and the blacked out window pillars to give this small SUV the sporty feel that it deserves with a name like Tucson Sport. Also, unlike many smaller SUVs, the Tucson has a stance that gives it more of an SUV feel where many small SUVs look and feel more like big station wagons. Finally, the back end of the Tucson has big, bold LED taillights, a low profile spoiler mounted atop the rear hatch and a pair of rectangular exhaust tips poking out of the right side of the blacked out lower fascia. More than many of the other small SUVs sold in America, the 2016 Hyundai Tucson Sport offers the look of a sporty utility vehicle rather than a big car, while the LED taillights, the LED daytime running lights and the projection headlights give the Tucson a very premium look – especially for a four wheel drive vehicle that costs just $28,570. 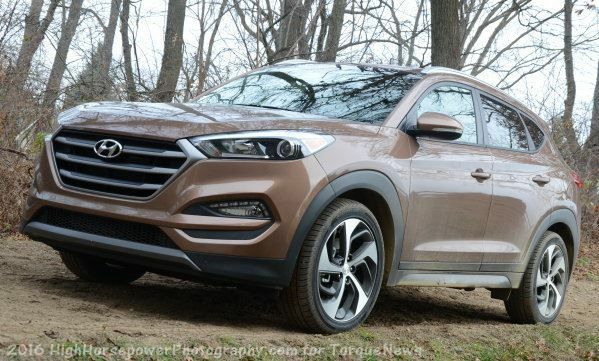 If looking over the outside of the 2016 Hyundai Tucson Sport AWD doesn’t let you know that you are getting a great deal for your money, the interior of this small SUV will surely seal the deal. My Tucson Sport test vehicle was painted “Mojave Sand”, so while other exterior colors get different interior color packages, my vehicle came with the standard “Beige” interior layout. That might not sound very exciting, but as you can see in the images here, the Beige interior package is actually a two-tone layout, with beige seats and center console along with beige trim along the doors and the bottom of the dash board. That light brown leather and trim work is contrasted by a ton of black trim – from the dash board and door upper portions to the steering wheel, the center console and the carpeting. The result of this two tone interior – especially with the heated seats – is a very premium look for the Tucson Sport. More importantly than the Tucson Sport interior being pretty, it is very comfortable and surprisingly spacious. The front seats are covered in plush padding with plenty of room in every direction, so both large and small folks with find driving the Tucson comfortable, but what is most surprising is the amount of space in the back seats. With many smaller SUVs, adjusting the front seats to accommodate a pair of 6 foot tall adults would leave the rear passengers with very little room for their legs and feet. On the other hand, the Tucson Sport has a ton or leg room and head room, so two taller adults can fit comfortably into the rear outboard seating positions. The center seat is still a little tight for a third adult, but this back seat will comfortably seat a pair of adults and a young teenager. Also, while the back seats fold down to create a massive cargo area, the standard rear cargo area of the Tucson Sport will easily hold a month’s worth of groceries, a couple golf club bags or even a couple huge ice hockey bags. Finally, the 2016 Tucson Sport AWD isn’t going to blow your mind with high tech goodies, but it also won’t force you to drive around without the modern features that come in most new models. A 5 inch touchscreen is mounted high on the dash and this small screen incorporates the sound system, the hands-free phone system, the vehicle settings and the rear view camera display and if you don’t like touchscreen functionality, there is also a panel of buttons and knobs just below the screen, along with controls for the stereo, the driver’s information screen, the phone system and the cruise control mounted on the steering wheel. The stereo system has full AM/FM/Satellite capabilities, along with both a standard jack and a USB jack for media input, but it seems that you cannot get the Tucson Sport with navigation. Really, when you factor in the blind spot monitoring system, the keyless entry, the push button start, the infotainment package and the heated seats, navigation and leather seats are the only modern niceties that didn’t make it into the Tucson Sport for the standard price. The 2016 Hyundai Tucson Sport AWD interior doesn’t have leather seats or navigation, but it comes standard with many features which were reserved for pricy luxury cars just a few years back along with gobs of interior space from front to rear – all for under $29,000. The technology is impressive but not mind blowing…the passenger and cargo space for a vehicle in this class is mind blowing. The 2016 Hyundai Tucson Sport AWD is powered by a turbocharged 1.6L 4-cylinder engine that delivers 175 horsepower and 195lb-ft of torque to all four wheels via a 7-speed dual clutch automatic transmission. That doesn’t sound like much, but in the compact form of the Tucson Sport, it makes for a surprisingly peppy little SUV. When you launch hard from a stop light, the turbocharged engine is quick to get you moving without any noticeable lag and the 7-speed dual clutch transmission moves smoothly and quickly through the gears, bolstering acceleration without shifting hard, like a more performance oriented vehicle. Of course, you probably aren’t going to tear up the local racing scene, but where many AWD SUVs of this size are sluggish from a stop and even less exciting on the highway – the Tucson Sport is surprisingly quick in any normal driving situation. It isn’t blazing fast, but you’ll have no problem merging in to quick-moving morning traffic or keeping up with the fastest moving traffic on your local highway. Also, if you want a little more spirited driving experience, you can switch the drive mode selector to “Sport” for sharper throttle input, more steering feel and altered transmission points for improved performance, while the Eco Mode does the opposite – relaxing the throttle and transmission action for improved MPGs. Next up, a look at the road handling of the 2016 Tucson Sport. This vehicle was not made for off-roading and I’m sure that no one at Hyundai would appreciate if I took their new SUV into mud that would be tearing off the fascias. However, my area is riddled with rough dirt roads which I drive regularly, and those muddy, rutted roads prove to be a great test of how a vehicle can handle the worst surfaces. Even with the Sport 19 inch rims and lower profile tires, the Tucson Sport does a fine job of making its way through the muddy puddles and the deep ruts of the local dirt roads. There is enough ground clearance that even the deeper holes and ruts are no threat to the bodywork and even when I stopped in the muddiest portion of the road, the Tucson had no issues driving right out. While I certainly wouldn’t take this small SUV offroading in any serious mud, the Tucson Sport handled the rough local roads better than many of the smaller SUVs I’ve tested recently. I also drove the Tucson around some of the loose dirt paths around our home and even on the steep slopes, the little Hyundai will soft-road with the best for them. Fortunately, I expect that very few Tucson Sport buyers will want to go offroading and Id imagine that the minority will ever deal with roads like some of the muddy paths in my area, but if they do – the Tucson is ready. Far more importantly, the 2016 Hyundai Tucson Sport AWD delivers a nice, smooth ride on paved roads. While there might be a touch more of the road harshness which sneaks in through the 19 inch rims and tires, the simple bumps in the road are muffled nicely before they reach the cabin. This is a great highway cruiser in terms of sound and vibration, but when you hit tighter, twistier roads, the Tucson Sport can handle the curves confidently. Many smaller SUVs are too soft to handle rough roads or moderate bumps on paved roads, while others which are designed to better handle rough roads offer a very stiff ride in normal driving situations. The Tucson Sport does a beautiful job of finding a balance between ride quality and capabilities on all road surfaces. I liked the 2016 Hyundai Tucson Sport a great deal simply because it does what many other small SUVs cannot. It is powerful yet efficient, compact yet roomy, affordable yet well-appointed and it handles rough dirt roads as well as it does tight turns on paved roads. The Tucson is fun to drive in almost any situation, it has real seating space for four adults, it has most of the modern technology featured in many luxury cars and it does all this for under $29,000. If you are looking for a small SUV and your key priorities are value for your money, interior space and a great driving experience – the 2016 Tucson Sport should definitely be on your short list of vehicles to drive before making your next purchase.